It's been a while since my last blog due to a combination of chaos and lack of internet! We are currently in between homes, having left my parents but staying with my very lovely friend Nic (she might be reading!) We have been to the apartment - (more on that later) and been busy sorting stuff out here and tying up lots of loose ends. This weekend will be busy, we have a leaving party at our local and also Christening / Leaving do on the Sunday. While I am looking forward to both I'm worried I'll be really upset saying goodbyes :( I almost feel it would be easier to just go now as it seems like I've already left, but obviously I wouldn't as I'm never one to miss a party! Well, we are another step closer - quite a big one in fact as our belongings are now somewhere between here and Cyprus! Yesterday morning the shipping company arrived and took all our loving packed (by Aaron who has done almost nothing else for weeks and weeks) boxes and packages. They are due to arrive about a week after we do, so plenty of time to get sorted out and get the Christmas deccys up! It was a very strange feeling watching the van drive away, it's starting to feel a bit more real but I still don't think I really "get" the fact that in 6 weeks time I will be in my new home, and new country! Very excited, slightly terrified but really want to get on with it now as living out of suitcases with a 5 month old baby isn't really ideal! I always said a plan would present itself and I was right! It was always going to be a big debate as to when exactly we should go permantly but after much discussion - well an hour or so in the pub! (we did continue the conversation for several days after but I think we had really both decided on the first one) we have finalised our moving plans. My parents have a buyer for their house, and A has no more work on his contract so we are off next month!!!!!!!!!! Everything is in action, we are packed for shipping, and they are picking up on Wednesday, from that day we will be living out of 3 suitcases as that is all we can take on the plane, well that a puschair, car seat, travel cot, 3 hand luggage bags and a baby of course! We are having Leo christened before we go, and it will also be our leaving do as we have booked our flight for 2 days afterwards. I can't promise I won't be crying by the end of it! The big question now is "when are we going!" and that is a very good question! Currently Aaron is looking for work and as soon as he finds something we are off pretty much. We have already sold our house so it makes sense to move asap as we are now paying the mortgage. Our immediate plans are a 4 day trip (child free as He's off to my mother-in-laws for the duration!) in November which is my wedding anniversary/birthday present from Aaron. Our apartment is in the village of Derynia which is on the east coast about 2km south of what is often known as "the ghost town" of Famagusta - the old tourist town which was abandoned in the invasion of 1974 by Turkey. You can actually see some of the abandoned hotels from our balcony. It's about 5 miles from Ayia Napa and Protaras so close enough to visit but far away enough that we're not surrounded by tourists all summer long! The apartment is a large one bed penthouse appartment, I say large as it is 79 sqm and if it was 80sqm it could be classed as a 2 bed! Aaron has completely redesigned the kitchen (It's what he does!) and so we now have a lovely big kitchen / living area with a breakfast bar and big patio doors which almost take up the whole wall, opening onto a balcony where we will have our dining table. After my standard answer of "Why the hell not!" I do have some actual reasons believe it or not! I think one reason I struggle to answer the question is that lots of the reasons seem to obvious to me now. It also goes back to the thought I had that everyone wanted to emigrate, and they would if they could. Some of my reasons - well without wanting to state the glaringly obvious but... the weather, I know everyone moans about the weather in the UK but I can't even begin to tell you how much I hate the weather here. Although I do wonder what the hell people talk about when the weather is completley predictable! The Mediterranen lifestyle, outdoor living, more relaxed (in some ways)- attitude to familes, great for kids. Good healthcare, state schools which follow the same style as UK, simliar legal system. 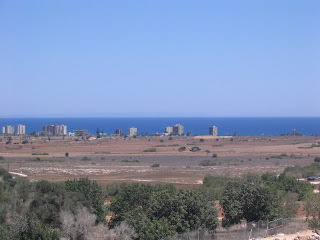 Our 1st trip to Cyprus was in August 2007, we went on a property viewing trip, 3 days being driven around by a sales rep, It was very helpful as we spent most of the time learning about the different areas and what it was like to live there once we had convinced Kev (our rep) that we were not buying on this trip. Property to have air con and a pool - I've ALWAYS wanted my own pool so there was no way I could be in Cyprus without one! "What it it all goes wrong?" "What if we can't get jobs"
"What if we can't pay the mortgage?" "What if we get sick"
"What if we think it's too hot"
"What if there is an earthquake, or a huge accident or we get abducted by aliens?" "What if..... we don't try and look back in years to come and really regret it?" "People don't just move abroad"
It turns out that the whole moving idea came about after a conversation between my Dad & A. Dad said he would love to move abroad but Mum would never go and leave me behind. As A. would go in a heartbeat but knew I would'nt want to leave Mum and Dad they thought this an idea worth pursuing! When A asked me, my inital reaction was "Don't be ridiculous" Apart from the fact I didn't want to leave my family and friends my main reason was "People don't just move abroad" At that time I completely belived that everyone wanted to move abroad but just didn't because you can't! I was genuinely surprised to find out that most people, although they may talk about it and say how jealous they are would have no intention of actually doing it themselves. "Do you want to move to Cyprus?" maybe years spent holidaying in Cyprus? a "too good to pass up" job offer? One evening (approx August 2007) whilst eating dinner Aaron (in the kind of tone you'd expect to hear something like "Do you want mayo with that?" or "Shall we watch Top Gear?") said, with no pre-amble at all "Do you want to move to Cyprus?" I will never forget that moment, it still cracks me up 2 years later! Me: "Cyprus??? Why would we want to move to Cyprus?" Me: We've never even BEEN to Cyprus!"